To say that the Flatford Summerhouse knocked our socks off is an understatement. 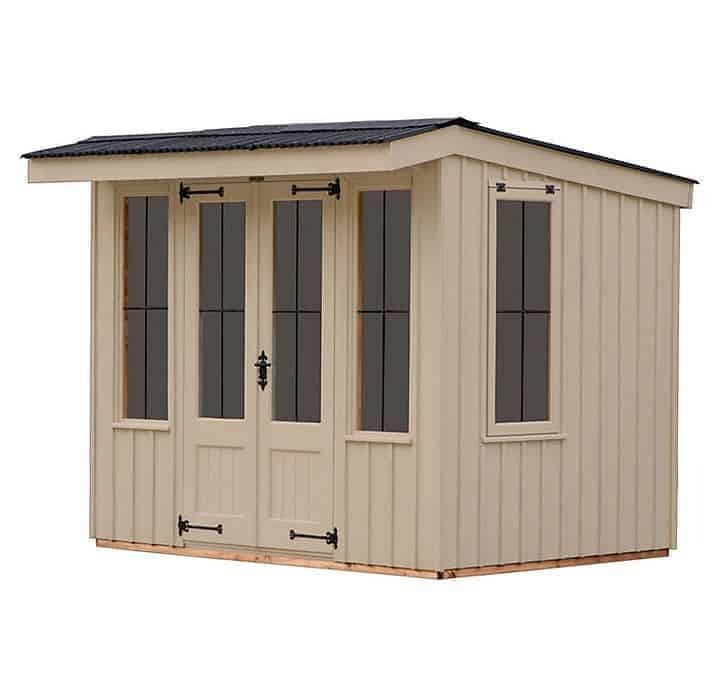 It is hard to think of a summerhouse or a shed that has made our jaws hit the floor like this bad boy did. The whole idea behind, Cranes National Trust series of sheds and summerhouses is to make them look like they could be sitting in some old, East Anglian garden or plot. 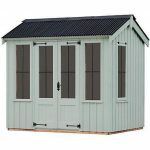 Great care and research was taken to make these have a really classic and high quality look and they certainly pull it off with this summerhouse. 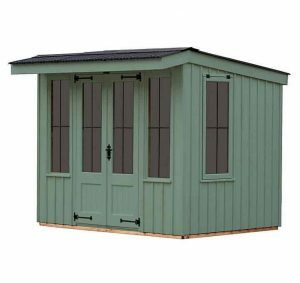 With large double doors, six windows, a truly amazing, corrugated roof, The Flatford Summerhouse would automatically make any garden it is placed in better! There are few sheds & summerhouses where we are confident that everybody (and we mean everybody!) will love the look of, but this is one of them. You will find it hard to find something else that makes this kind of impact in your garden. 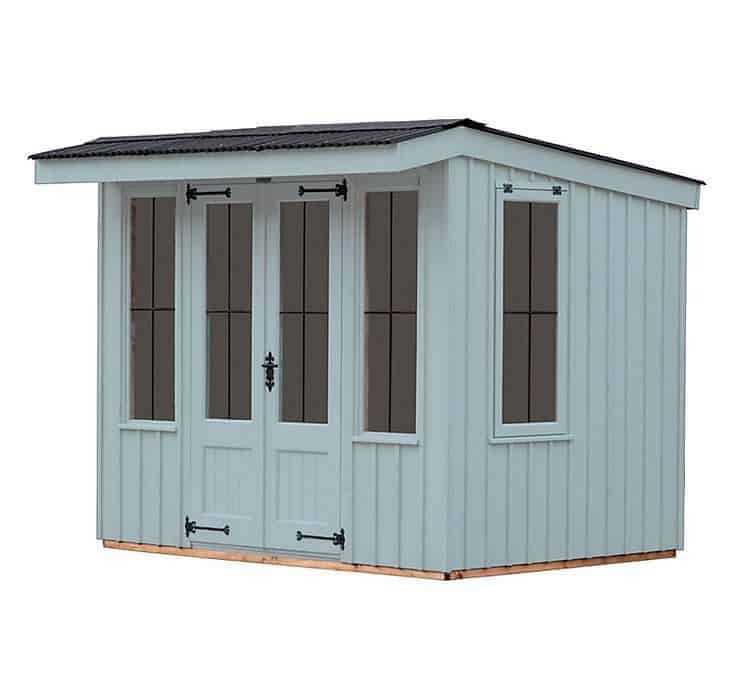 This is a summerhouse that will no doubt have many of you (like us) fall in love with it at first sight and with good reason to it is blooming gorgeous. But to make sure you fine folks know you are getting value for money, we have taken a real good look at this summerhouse to see if it is as epic as that first impression makes out! This is a very spacious summerhouse and will easily be up to the task of having a couple of chairs, tables, some shelves and if you really want to live it up……… a little TV and mini fridge if you can run some electricity in there! The summerhouse has a very good size to it with, 9 feet 8 inches in length, and 5 feet 9 inches in width. As you can see it is the length where most of the space in the summerhouse is, but we think it gives you a very good amount of space to play around with inside. The summerhouse in some ways feels like Dr Who’s, Tardis where it is way bigger on the inside than it looks on the outside. The height is just ideal offering you roughly seven feet at the front of the summerhouse at the highest point and 5 feet 9 inches at the lowest. 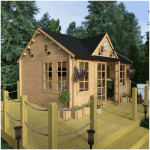 In all this summerhouse has more than enough space for you to create your own dream little getaway spot right in your garden. We love what Crane have done with the roof here. A corrugated roof is a real hallmark of the National Trust line and it is something that many people really get a kick out of. The roof is an apex style roof, but to stop it looking like a shed, Crane have made the front of the roof and the back be at slightly different angles. This will still offer you protection against the rain, but it looks amazing in the process. 19 x 125 tongue and groove boards are what is underneath the corrugated roof and these are just great boards. One thing that we flipped out over and were really taken by surprise with was the ceiling. This is a place where you come to relax and looking up at roof boards is not exactly relaxing now is it? Well in keeping with the high quality of the rest of the summerhouse we have a nice pine wood, tongue and groove ceiling. That amazing corrugated roof is not the only part of this summerhouse that gives it, its old, English style. The cladding that is used here is vertical, sawn board cladding which is a very nice thickness of 12 x 150 mm and then topped with 16 x 38 mm. These are some very sturdy walls! The wood that these are made with is some very nice, strong and long lasting, Scandinavian Redwood. This is top of the line wood and will make sure that you have a summerhouse that will be very long lasting and it will look great for many years. While we love the protection that you get with cladding such as shiplap cladding. There is just something so very “old school” about this type of cladding and we love it and think it works very well for this summerhouse. And because of the way the cladding has been made and the wood that is used, you have no worries about any water getting in here! To really make this a fortress of a summerhouse that is going to be still standing many years after it has been built, Crane have used some very tough framing. The frame is made for that very same, Scandinavian Redwood which the cladding is and it is a very nice, 38 x 50 mm thick. This frame is something that really impressed us with the Flatford Summerhouse. 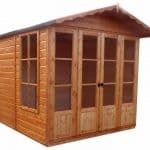 To many summerhouses and sheds start to get weak and flimsy after just a couple of years due to weak frames……… That will not be a concern for anyone who buys, we are sure of that. Once built and you have a quick look around, you will notice that this really does have a very sturdy and just high quality feel to it. The flooring of the summerhouse is made from the same strong wood and is actually the exact same 19 x 125 mm tongue and groove boards that are used on the roof. These team up with 38 x 50 mm floor joists to give you a floor that can take a lot of weight and does not feel cheap or have that weird bouncy feeling. This flooring is more than able to take a few chairs, tables and if you want you can have a wine cooler in each corner of the summerhouse……. Actually we think a cooler in each corner may very well help the structural integrity of the summerhouse, ok so maybe not, but at least you will never have to reach too far for a drink! We think that the two year warranty that covers you against any general wear and tear is fair. This is a very well made summerhouse so chances are you will have no issues, but if you do then Crane will come and make the repairs. It is worth mentioning that your warranty is not valid if you do not take Cranes advice on where the summerhouse is built in your garden. So if you insist they build it in an area they warn you is not suitable then you will not be covered. The doors are one of the most standout features of the Flatford Summerhouse. They are nice and big double doors which means there is none of that twisting and turning things to get them to fit, you can just walk in with pretty much anything. When open you have 1830 mm of width and 1100 mm of height to get in and out of! To make sure that even after many years the doors will be still standing strong, Crane have used some very cool looking, Fleur – de- Leys hinges., Each door has a nice large window that is made from 4 mm thick, extra toughened glass. Using real glass was such a cool design choice and we think it just adds to the “high quality” look. Inside each window is this lovely lead cross which just adds to the charm of the windows. As well as the two windows on the doors there are another four windows with two more on the front and two on the sides. These windows are a couple of inches taller than the ones on the doors, but are made with the same 4 mm toughened glass, have the lead cross feature and the two on the sides even open! The windows that open on the sides do so with these black hinges that may not sound that exciting, but they go very well with the rest of the summerhouse. Thanks to a very nice looking lock and key which is in that same black style the door and window hinges are, The Flatford Summerhouse will be locked up nice and secure. While the idea of a summerhouse is to have it open and be able to sit and enjoy a nice day, we know that this may be a bit lacking in privacy for some people. 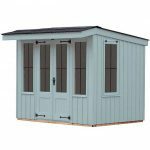 We have seen this summerhouse look really nice with some curtains or a set of blinds which will give you some privacy if you want it. Crane offer a choice of six colours for the summerhouse. These are, Wades Lantern, Earls Grey, Disraeli Green, Terrace Green, Dome Ochre and Painters Grey. These six colours are all pretty different from each other so we are sure that there will be that ideal colour that you not only like, but will also fit in with the rest of your garden. We cannot stress just how high quality this summerhouse looks. Even from photos you can see this is top of the line all the way and when you actually touch it, you can understand why the price tag is what it is. Crane use just the very best of the best when it comes to the materials. The corrugated roof, cladding, strong frame and those very tough windows are part of what makes this a summerhouse that will be still standing strong after many years. 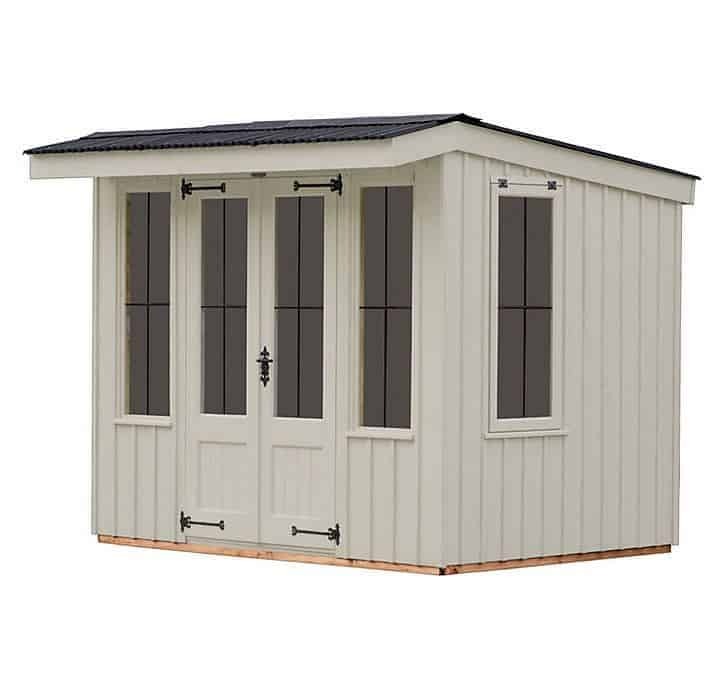 This is a very good sized summerhouse where you can easily fit a few people in here and a bunch of stuff as well. We love how it is much bigger on the inside than it looks on the outside. 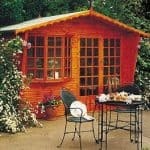 This is a great sized summerhouse and the only problem is having a garden big enough to handle it! One thing that we really love about Crane is how they will come and install the summerhouse for you! No getting all stressed out and having a poorly built summerhouse when you buy this! As well as not having to get all sweaty and dirty, you also will be sure that the summerhouse has been built properly. 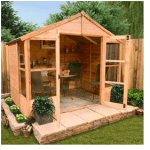 We know a price tag of £4,899.00 and the phrase “value for money” may seem like an odd pairing, but while the price is high, you are getting a summerhouse that looks fantastic, but it is also made from the finest materials and will last you for years and years. A lot of time, effort and care has clearly gone into designing this summerhouse. Final Thoughts: We think this is just a great looking summerhouse. Crane have pretty much done everything right in terms of the aesthetic design of The Flatford Summerhouse. 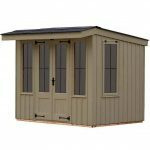 This version of the summerhouse offers a great amount of space and let’s not forget it is built with that long lasting and strong, Scandinavian Redwood. 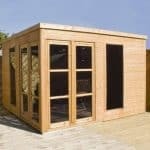 We know that this is a very expensive purchase, but this is a luxury type of summerhouse and if you really want to have something special and something that is going to last for many years in your garden then this is it!